It’s practically guaranteed that enterprising mom wasn’t thinking about the nifty science behind her son’s inflated diaper and how it kept him dry, even under extreme conditions. But ultra-absorbent polymers, also known as hydrophilic polymers, are among the coolest of polymers, and their applications go far beyond some fun and a dry bottom. Hydrophilic polymers can absorb water equivalent to hundreds of times their own weight. That’s because instead of dissolving in water as other types of powders do, ultra-absorbent polymers create a physical – not a chemical – bond with the water. Because they’re made up of long chains of huge molecules that are strung together and cross-linked, the molecules of these polymers are flexible enough to absorb water through osmosis. From that rather high-tech process come some visually captivating results. Check out the embedded video for an example of how a miniscule amount of powdered polymer can absorb a relatively huge amount of water and become a gel. Disposable diapers are, perhaps, the most well-known application of ultra-absorbent polymers. You’ve probably seen at least one commercial in which the savvy friend shows the clueless new mom the ropes of good diapering by dumping a beaker of water into a disposable diaper to demonstrate its absorbency. And school kids across the country have learned about endothermic and exothermic reactions by playing with “instant snow” polymer. Yet the applications for these amazing polymers are many, spanning virtually every industry. Farmers first began to use these polymers as a way to help soil retain more water. In the 1970s, they started appearing in disposable hygiene products like diapers. Today, they’re being used in pharmaceuticals, medical devices, cosmetics, and even to remove metal contaminants from soil. Because every polymer — even the really useful, amazing ones — is comprised of multiple monomers strung together in a specific sequence, it’s vital to know that a polymer is properly constructed, free of contamination and performing as desired. That’s where we come in. 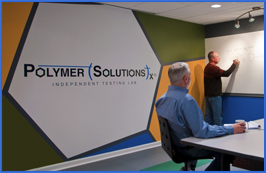 Polymer testing can help you understand how much fluid your hydrophilic polymer will hold, how well it works with different types of liquids, what factors can influence its absorbency, and how changes to the monomers can affect the polymer chain. Hydrophilic polymers have improved modern life in many ways, including making it easier to entertain kids and clean up some unpleasant messes. How is your company using ultra-absorbent polymers in new ways? Tell us in the comments section. Very cool video! Thanks for sharing!